When you think of the New York Islanders turnaround this season, three words come to mind. But that first term though, improvement, a long list could be formed to describe how much of it has taken place up and down the roster. And it starts with center Brock Nelson. Nelson, the 27-year-old UFA to be, is currently experiencing the best season of his career. His insurance goal yesterday — a wraparound after he beat Arizona goalie Darcy Kuemper to the right post — sealed the Isles a 2-0 victory and was his 50th point of the year. The goal marked the first time that the Warroad, Minnesota native eclipsed the 50-point plateau as a pro. The goal also was Nelson’s third point of the weekend in which the Islanders swept both must-win games against the Flyers and Coyotes on a back-to-back situation. This past weekend was just the culmination of what has been a wonderful campaign thus far for Nelson, one that many thought would never take place. Dating back to July, before he agreed to a one-year deal at $4.25 million dollars to avoid arbitration, many stood by the notion that Nelson’s spot in the future of the organization had reached a critical stage. 2017-18 was Nelson’s most unproductive season aside from his rookie year; He failed to hit 20 goals and at least 40 points for the first time in three seasons; His two-way play and refusal to use his large frame to his advantage — usually missing from when he basically first arrived — was overly bad last year. What also made the outlook for Nelson harder, when captain and first-line center John Tavares decided to leave in free agency for Toronto, not one soul, fans and critics alike, believed he would totally flip the switch. Nelson got even more confounding looks when he was quoted saying “It’s a lot of opportunity for some other guys to step up, some new faces we got, so there will be some change obviously, but we have to feel it out and go with it” to NHL.com a short time after Tavares departed. Reason why? He should have been looking right in the mirror at himself as one of those supposed guys who needed to step up. Enter Barry Trotz and Nelson becoming a new father. For nearly his entire tenure with the organization, former g.m. Garth Snow and head coaches Jack Capuano and Doug Weight coddled the former 2010 first-rounder. There were numerous moments over the last three-plus seasons where Nelson would be invisible on most nights and deserved to be scratched. But it never happened unless he was injured. The fact Nelson got to keep his spot despite his wild inconsistency raised a lot of eyebrows from a majority of the fan base as well as writers who covered the team. So when Trotz arrived on Long Island — fresh off his first Stanley Cup win with the Washington Capitals — there was a slight glimmer of hope that he could finally be the one that pushes Nelson to be the player he’s more than capable of being. And boy did Trotz do that. In training camp, Trotz spoke vehemently about wanting Nelson to be a player the team can lean on. He envisioned the five-year pro as a proverbial part of the Islanders top-six and taking some of the heat off the shoulders of second-year player and reigning Calder Trophy winner Mathew Barzal. Safe to say, Nelson took that task to heart and Trotz now has full trust in him. Watching Nelson this year, he looks more engaged, more poised, and playing physical than any other time in his career. Has there been a time during the year when there was some inconsistent play? Sure. But, there’s been very few games this season where his disappearing act has returned. “I have a tremendous amount of trust [in him]. He’s one of the better two-way players. He’s cerebral, he does things the right way, he has a real good skill set and when the game is on the line, he can put it away,” Trotz told NHL.com about Nelson earlier this season. As for becoming a new Dad, Islander beat writer Arthur Staple for The Athletic NYC said in one of his Q&A’s that the adrenaline could also be what has driven Nelson’s strong performance all season. We’ve seen the same with his mates Johnny Boychuk and Casey Cizikas, but at such a huge time for the organization and his own career, Nelson getting that “dad strength” has changed him. Getting a new contract and a nice raise no one can deny are also added incentives for how Nelson has performed this season. Then again he’s had now a good two or three-year year window to do exactly what he’s done this year. It just never occurred. And the whole argument for that could be that Capuano or Weight never trusted Nelson the way Trotz did. They weren’t real NHL head coaches, Trotz is. With Trotz here for the long run, it’s hard to see the Isles not re-upping with Nelson if this year was just the start of his ascension as a player. The contract talk can be saved for another day, right now Nelson has found a new level in the second half. The Minnesota kid @Bnelson wins it in OT. Even as the Isles have skidded to the finish line — but are still very much in a position to make the postseason — Nelson’s been clutch. His goal on Saturday against Philadelphia tied the game in the first period and settled the Isles back into the game after they gave up a fluke goal earlier in the period. The tally was also the team’s first after going nearly 135 minutes without a goal. The play he made to set up Josh Bailey’s game-winner late in regulation was exceptional. 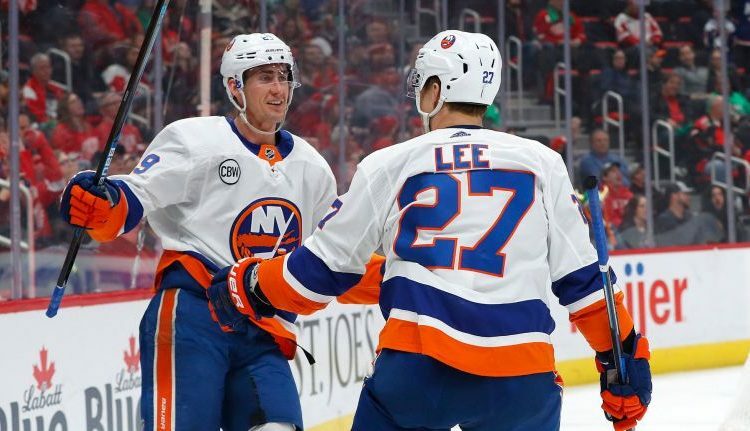 His performance in his home state last Sunday (assist on the Anders Lee’s go-ahead goal and game-winner in OT) helped carry the Isles to a win in a game that they had a hard time generating offense. To say Nelson’s transformation this season has been an underlying factor to the Islanders success is putting it lightly. At a time when the franchise as a whole not only a chip on its shoulder after losing its captain for nothing, but also needed one of it’s best offensive players to take the next step, Nelson has elevated himself in tremendous fashion. He’s third on the team in points and still has a shot to match or beat his career-high 26 goals. I don’t think anyone could have expected what Nelson has done this year, but’s he proven a lot of people wrong.